The last guitar capo you will ever need! Let's face it, you shouldn't have to think about your capo. It should be easy to use and it should work properly every time. The Kava LegendPRO guitar capo is designed to allow you to focus on what's important- your music. Its easy-to-use design fits comfortably in your hand and allows for quick positioning using only one hand. The high density silicone pads and heavy duty internal memory steel spring deliver just the right amount of pressure to hold your strings tightly without damaging your instrument. The premium alloy metal is built to last and won't weaken, bend or break like other cheaper alternatives. Take the frustration out of buzzing strings and missed transitions by choosing what the professionals use. Whether you're a rock god playing to a sold out arena or a newbie practicing your chords in your bedroom, the LegendPRO delivers the clear, consistent sound you're looking for. The Kava LegendPRO's superior quality is backed by a Lifetime Money-Back Guarantee. If you're not completely satisfied we will return your money, no questions asked! 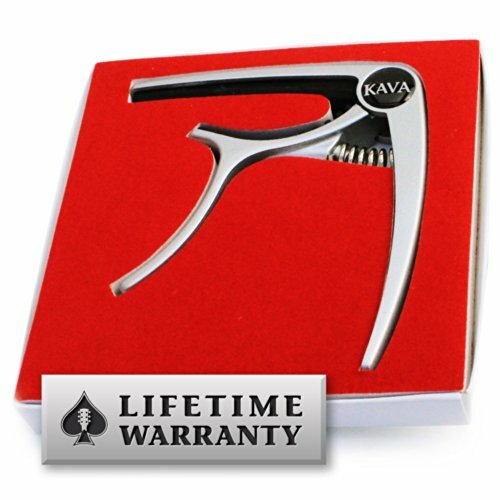 Get back to your music and pick up your Kava LegendPRO guitar capo today! If you have any questions about this product by Kava Audio, contact us by completing and submitting the form below. If you are looking for a specif part number, please include it with your message.